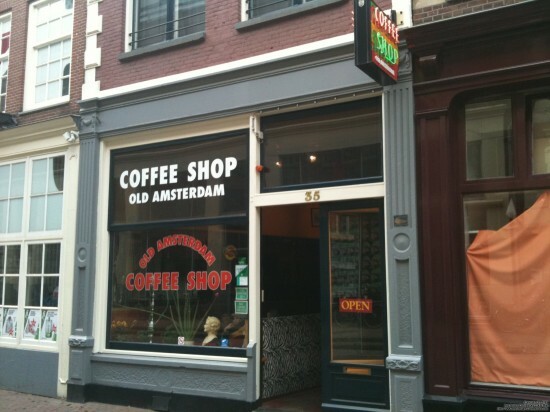 Despite being practically on the Rembrands Square coffeeshop old Amsterdam was a nice surprise! On entering we were greated by a friendly man who I assumed is the owner. It was a pretty busy fridaynight but he was very helpful in helping us choose a nice weed and even going so far as opening practically every bag in the house for us to smell. The menu wasn’t bad either, with a couple of nice hazes on there aswell as some other good varietes. Unfortunately for us most of the haze was out of stock at this time so we chose a very good bio cultivated weed. The seating isn’t much to brag about. A couple of tables with woooden chairs and one couch in the corner in front of the big window overlooking the street. The couch was very comfortable however you do feel a bit like being in a fishtank with all the tourists walking by and being in the condition you are most likely in at this time that doesn’t always go down well…..
You can get coffee and tea from a machine and softdrinks from the counter. Even though the ambiance isn’t all that the atmosphere was cool. Nice and laidback and we enjoyed watching all the tourists getting their first legal taste of Amsterdam Mary Jane!